I love cilantro. I know it’s too much for some people, but I grew up in southern California and Mexican is my favorite cuisine. I love cilantro in my salsas (especially good in a mango pico de gallo), I love cilantro in my tacos (it pops so well against soyrizo! ), and I especially love cilantro in my favorite food of all, the burrito. It’s also great in Thai and Vietnamese, and of course in the ever-important green smoothie. I guess that’s why I grow so much of it! But why am I talking about cilantro? I though this was a post about harvesting precious coriander . . .
Well my dears, they are in fact one and the same. Well, sort of. Both ‘cilantro’ and ‘coriander’ can be used to describe the plant as a whole. But in common culinary terms, cilantro is the leaf and coriander is the seed. These seeds have a delightfully warm, nutty, almost citrus-y flavor, and are an integral staple in Indian and Middle Eastern dishes. So until recently, I was one of the many people who grew my own cilantro, but purchased my coriander. How silly! With a little patience (a relaxing Sunday afternoon with a really fun podcast) and a little planning, it’s easy to ‘have your cilantro, and eat your coriander too’. 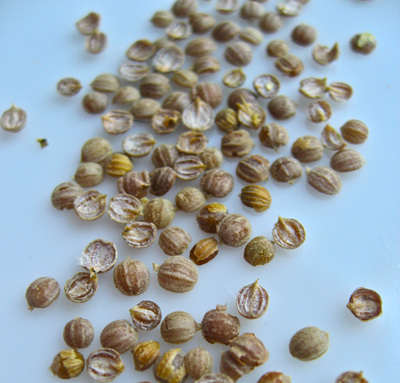 Coriander seeds form when the cilantro begins to dye back. 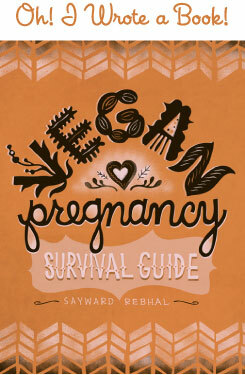 Allow them to mature as the plant browns, and then harvest the plant before they’re released. Place the plants in a brown paper sack to dry out completely. A week or two later, remove the stalks from the bag. The seeds reside in little round pods at the ends of the stems. 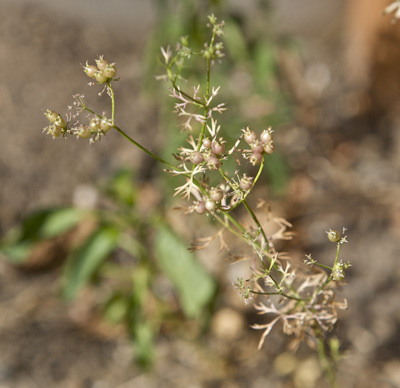 Separate the seed pods and compost the leftover debris. 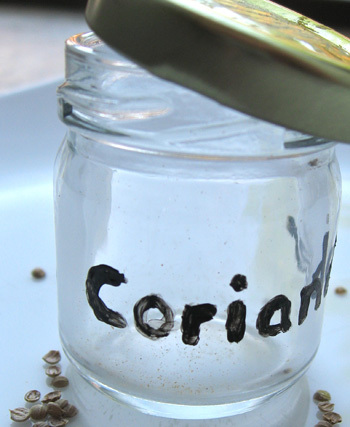 Store your spice in a tight-lidded jar in a cool dry place. 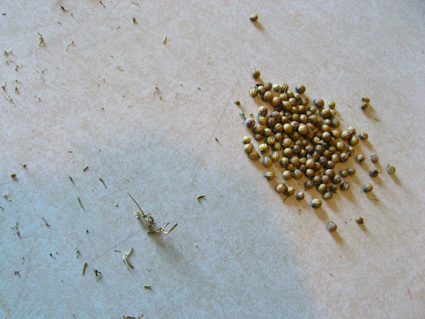 I still haven’t found a good use for coriander (I love Indian – Indian doesn’t love me) but for some reason my cilantro has never produced these seeds. I harvest the leaves pretty rapidly for pesto as a basil substitute, and have done do for most of a year, so the plants have age on them. Any advice on getting these huge cilantro plants to produce seeds? @ me3 – The seeds will come after the flowers. Has your plant flowered? Is it outside? If it’s almost a year old it seems about time! Hmm, I’ll have to look into that . . . I save my coriander seeds also. The spice is expensive to buy. I add grounded seeds in to chili and stews. This is the first year I have grown cilantro. I have left some go to seed but I have a question. I have a lot of seeds but they haven’t turned brown yet. We are expecting a frost and I’m not sure what to do-harvest green or cover or ??? 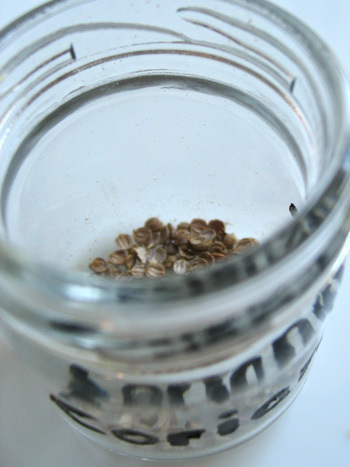 Do you use your saved seed to grow next years crop. I have done this for the past couple of years but wonder weather or not this will eventually weaken the strain of the seed. Anyone know about this? I do not understand what you mean by remove it from the pod. it seems to me that is an unnecessary extra step. Just make sure to remove the stems and other plant matter and you should be fine.